Why Might Your Commercial Facility Need Custom Louvers? Your commercial facility might benefit from the installation of custom louvers. Custom louvers offer excellent benefits, including reliability and security. Have you been considering if your commercial facility would benefit from the addition of custom louvers? If so, you’ll immediately see why many businesses depend on louvers to surround their facilities in secure professionalism. Think about the quality and function of louvers and what those factors will bring to your business. The number one reason your commercial facility needs custom louvers is for the security. They create a barrier between your facility and trespassers. They add another layer between your valuable property and would-be intruders, making it more difficult for people to gain access to your property. 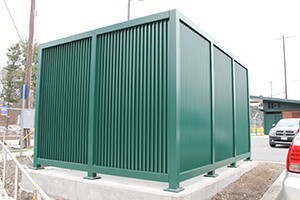 Speaking of access to your property, custom louvers give you more control over who is allowed access to your facility and who isn’t. You’ll be able to assign keys or codes to authorized people, or even use an intercom system that allows you to buzz in guests and other welcomed visitors. Custom louvers aren’t systems that you’ll ever need to worry about. They are made with quality materials that will stand the test of time, to protect and differentiate your facility from the surrounding area. With the proper maintenance, you can expect long-term reliability and excellent performance. It will become immediately evident that your investment was worth it. The way your business looks in the community is important for your company’s reputation. Custom louvers add a sense of dependability that makes the facility look trustworthy and stately. These types of investment also show your commitment to the community. Continuing to invest in your property means that you’ll be there for a long period of time, bring more jobs to the people that live in the community. Once you have your custom louvers installed, you are creating a relationship with your installation company. That means that if you ever have any questions or concerns about your louvers, you can call those representatives to come out and service your louvers. This relationship ensures that your investment will be protected by a professional and quality service. This entry was posted on Friday, February 16th, 2018	at 4:13 pm	. You can follow any responses to this entry through the RSS 2.0 feed. Both comments and pings are currently closed.